 A simple and easily produced tool that might just save you from a world of discomfort. This is the Woodwork Junkie “How to?” – DIY table saw push stick making tutorial for beginners. 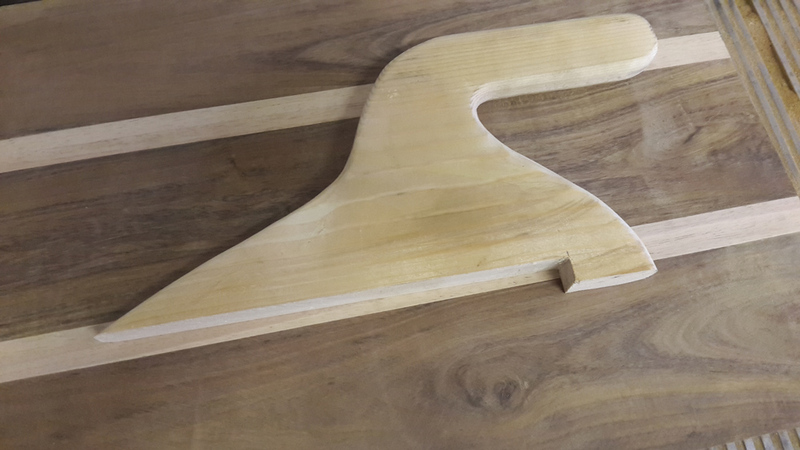 A push stick is a tool that can be bought or alternatively, easily produced yourself and although very simple in design, plays an important role in the safety operating procedures of a table saw. Table saws are useful tools that can chew through a piece of wood but when not used correctly will show no mercy in its retaliation. The main focus of push sticks is to extend arms reach when operating a table saw and so allowing the operator of the saw to increase the distance between their limbs and the very dangerous rotating blade of the saw. Your main focus here should be a tool that can hook the workpiece and trough applied pressure, feed the workpiece trough the blade with the objective of clearing the operator’s hands from the blade. Ideally, should something go wrong and kick back occurs, the push stick will take the punishment from the blade. Figure saw, jigsaw or scroll saw. 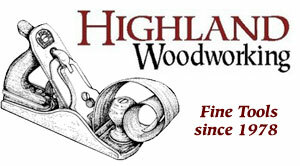 Get hold of some scrap or off-cut wood. 7×14 inch. 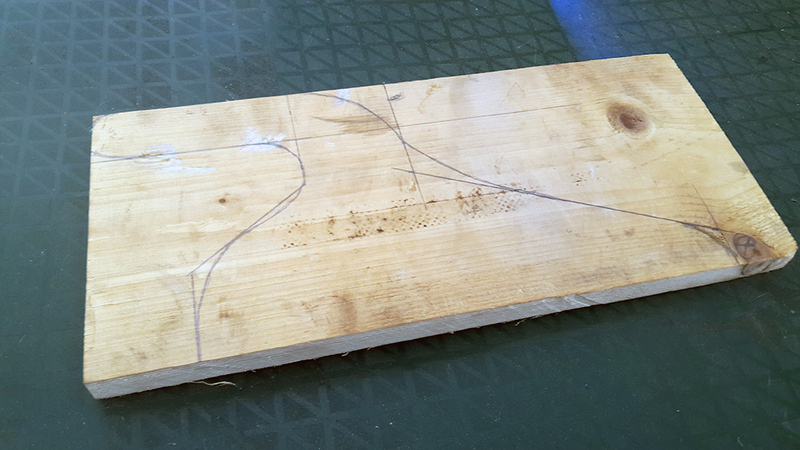 Using the measurements supplied, plot out guidelines on the piece of wood. Note: that there are no knots inside the area that will become the push stick as these can be potential weak points at which the stick can break while being used. Using measuring equipment and a marking tool, plot out the push stick on the piece of wood as per the supplied dimensions. Using the marked lines as a guide, free hand draw a curved edge for a more comfortable look and feel. This will be the cutting line. Using a marking tool that produces a more prominent line or a different color can make differentiating between the lines easier. With a scroll or figure saw cut along the guidelines to produce the rough push stick. (If needed a jigsaw can also be used). 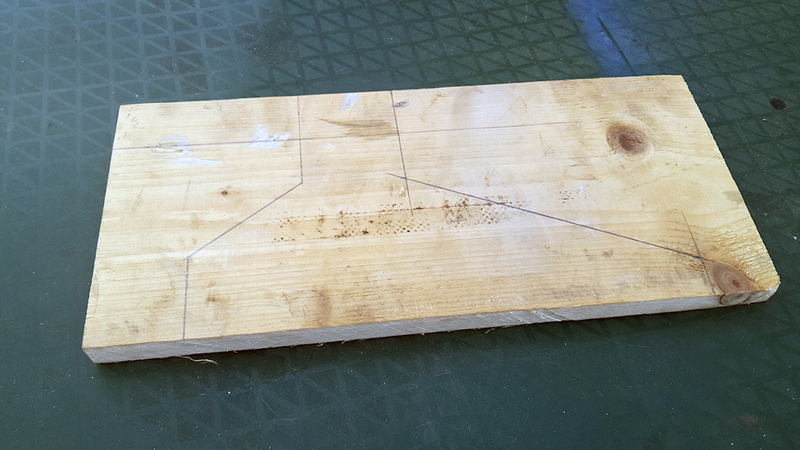 Use a router to cut a curved edge on the push stick for a better look and feel. Do not router the base (sole) of the push stick. 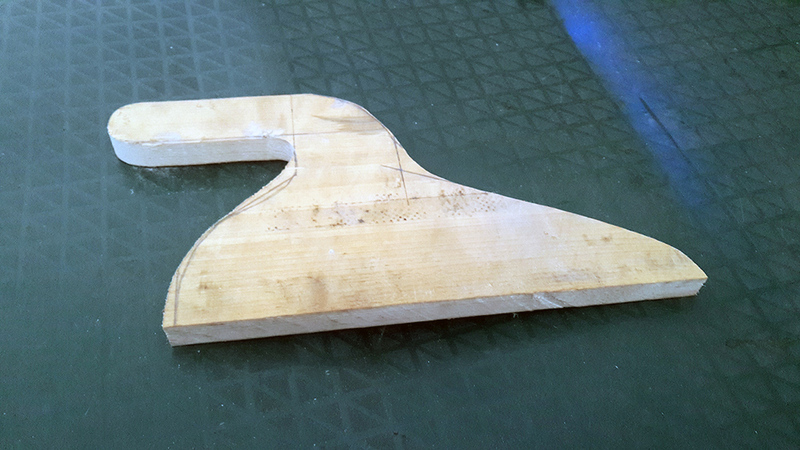 When completed all that is left is to cut the heel in and sanding down the push stick for a smooth finish. As indicated in figure 1 & 2, cut in the heel of your push stick. 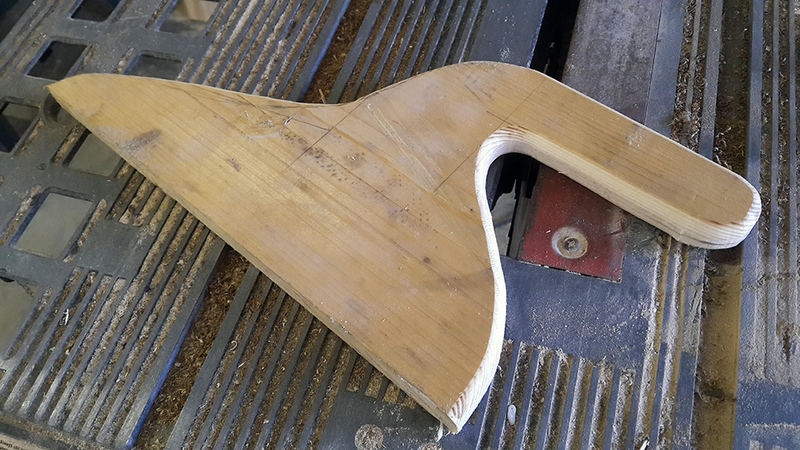 When doing so it is important to keep in mind that a deeper heel offers more control but also limits the operator with regards to the minimum stock thickness it can be used on (The stock should not be thinner than the heel of your push stick). The heel in this tutorial is a 1/2″ deep but can be produced at a 1/4″ to accommodate thinner stock. Table saws are dangerous if not used correctly. If you have no experience or you are not familiar with the operating procedure of a table saw it is strongly advised that you only use the saw under supervision. ALWAYS follow the safety instruction in the manual of your saw and use the appropriate protective equipment. I have my own table saw but haven’t done any woodwork in a while. The last time I used it I needed a push stick so I cut the end off an old wooden clothesline prop and used the end of that to push the wood through. The great thing about these types of push stick is the amount of control they offer as opposed to just a stick with a notch to push the stock through the blade. As far as table saws go you can never be too safe. 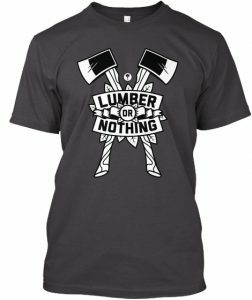 Hey, I love wood working and have created many pieces for my own personal use. I don’t have a table saw. I use a jig saw and an electrical hand saw. Making very simple pieces out of refurbished wood. I love your push stick and has given me a great idea how to create one for my electrical hand saw. Keep up the great work helping other be safe. Happy woodworking and remember, safety first. Great design, practical as well. 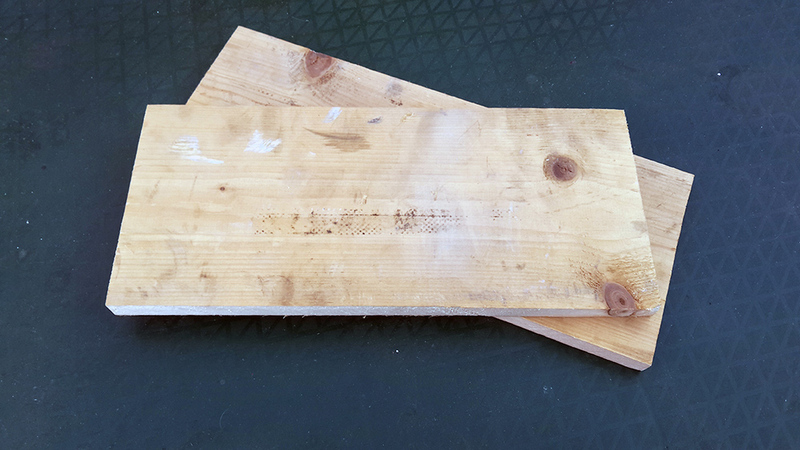 Working on a small table like saw can definitely be riskier. Especially because you will find your hand closer to the blade. Scaling down an existing design might not be the answer as it may create a weak point that has the potential to collapse while using it and you don’t want that. If you can reply with the model of the saw maybe I can look into it for you.